Highly motivated, well organized professional accountant offering over 8+ years experience in Accounting. Expert in account reconciliations, payment processing, journal entries, data entry, billing and collections. Outgoing, with strong communication skills and a creative talent for cultivating rewarding relationships with customers, peers and supervisory staff. Dynamic learner with facility for rapidly mastering new modalities. Highly competent in MS Office, JD Edwards, Oracle, ImageNow and other various accounting programs. Log and scan all incoming payments from university retail outlets. Apply payments from bank lockbox to appropriate invoices. Process credit card transactions from university branches. Export all credit card transactions and apply payments to clients open invoices. Apply ACH payments to open invoices. Assist Accounts Payable with verifying vouchered batches for errors. Scanned, coded and vouchered invoices for payment using ImageNow. Prepared and reconciled bank accounts for deposit. Conducted monthly self audits to maintain internal controls and ensure Sox Compliance. Processed financial calculations such as amounts due, tuition credits and refunds to be made for student withdrawls. Calculate, prepare and issue invoices , account statements and other financial statements according to established procedures. Monitored and collected on all out of school accounts keeping bad debt at a minimum. Assisted with month end closing procedures. Performed variance analysis to determine root cause for each significant variance relating to specific accounts. Review activity reports to ensure personnel have achieved sales quotas. Processed claims promptly and credited collection's to policy holder's accounts. Reconcile earned commissions with commission advances. Performed inventory control of all office supplies, forms etc. Assist in claims management. Review insurance policies. Handle all incoming calls. 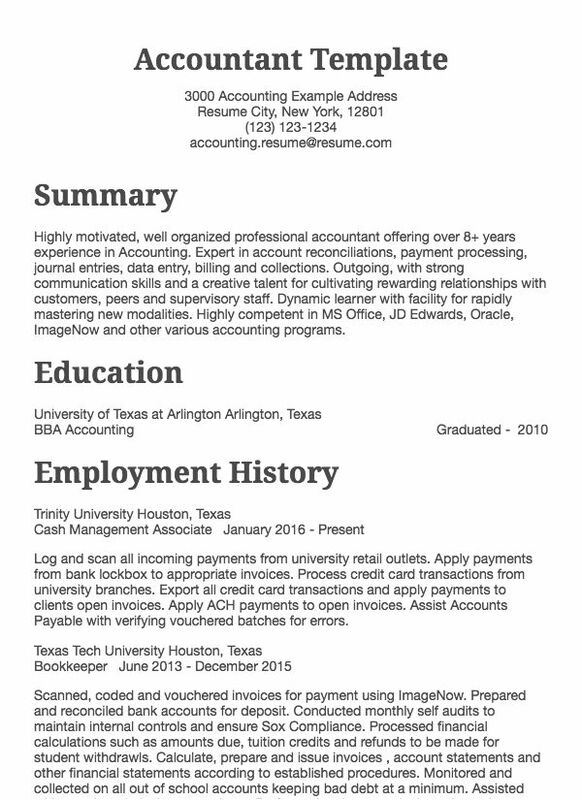 Use several accounting skills in your resume to ensure you have the right keywords for ATS systems to parse through. Add about 5-10 in the skills section of your resume and try to fit some in (as appropriate) throughout the other sections of your resume (summary, experience, job titles, and education).